Nov 9, 2013; College Station, TX, USA; Mississippi State Bulldogs defensive lineman Denico Autry (90) sacks Texas A&M Aggies quarterback Johnny Manziel (2) during the second quarter at Kyle Field. NEW YORK (AP) — LeBron James speaks often of his love of football and willingness to help younger players. It makes having a relationship with Johnny Manziel a perfect fit. James says he texted the 2012 Heisman Trophy winner often this past season after Manziel’s camp reached out for advice on how to handle intense scrutiny, something the four-time NBA MVP has been dealing with since high school. 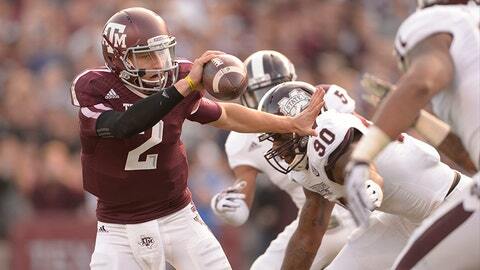 James was in contact with Manziel before and after the quarterback’s Texas A&M games this fall. James and Manziel will apparently have plenty more chances to interact in the future. Manziel is opting to be an early entrant to the NFL draft and is expected to be affiliated with LRMR, the management company operated by James’ close friend, Maverick Carter. Said James: "We’re just happy we’re able to be a friend of his."